The best thing about online shopping is that today it can be applied almost every vertical that also includes food. Using Runnr coupons you have the chance to select from a wide range of food choices that are available online and can order the same online and have it delivered to your doorstep as well. You can be seated at the comfort zone of your house or be there working at a business plan at office late evening and place order for your favourite platter and cherish the dish as it arrives before you. Offers include as much as Rs.100 off on a billing amount of Rs.250. There are many such offers that are provided from time to time. Want to grab the best deals? Book using HappySale and you’ll always end up with the best and the real deal, that’s cost-effective. Go grab your deal today! Verified on 20/4/2019 .. Order delicious food online at Runnr and avail flat Rs 100 off on your minimum orders above Rs 250. 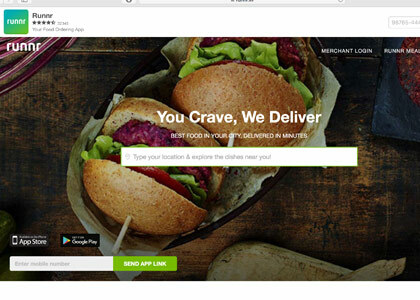 Look on to the landing page where you can choose from various restaurants in your location and place your orders. Apply Runnr promo code on your checkout to grab this best deal. Book With HappySale online deals to save more. Avail flat 10% discount on online food order at Runnr. This offer is applicable for both old and new users online. No minimum order worth is required to avail the discount. Verified on 20/4/2019 .. Flat 20% discount on online food orders at Runnr. No minimum order worth is required to avail the discount. This offer is applicable for both old and new users online. Order now! Verified on 20/4/2019 . Order delicious food online at Runnr and avail flat Rs 100 off on your minimum orders above Rs 250. you can order from various cities like Hyderabad, Bangalore, Pune and lot more. Verified on 20/4/2019 . Exciting offer for old and new users online. You can order your favourite food from various cities like Hyderabad, Bangalore and lot more. No minimum order worth is required to avail the discount. Order today. Get best price on online food orders at Bangalore. This offer is applicable for both old and new users online. No minimum order worth is required to avail the discount. Verified on 20/4/2019 .. Get flat Rs 75 off on food orders of Rs 300 & above. Applicable for first time users only. Apply coupon code at check out page to get discount. Place your first order now! Pls Note: Runnr App is offering services only in South Mumbai as of now and very soon be expanding across India. Hurry up. The online world is expanding at a fast pace and making it increasingly easy for everyone to order to anything and having the same delivered at your doorstep within the committed time. Ordering food online was practically an impossible task a decade or even couple of years back. Today, it is a reality and you also have the choice to order for the best food deals online. Of the many brands that have made this possible, Runnr has created a positive impact amidst the customers. And today, to attract more and more customers, the brand has also come up with Runnr coupons that you can easily have access to if you are availing the same from HappySale. Not always do you find it easy to walk up to or drive down to your choicest restaurant and savour your best platter. Sometimes, you are out of time and sometimes out of energy after a day’s work. So this is where the discount coupons by Runnr come to use. You can simply place an order for your best food dishes from your favourite restaurants and also get a discount for the same. And the timely delivery of the food parcel to your place is an added advantage as well. You can count on the food quality as Runnr has the best restaurant listings. Wondering whether it’s tough to browse and select from the Runnr coupon codes that are available online? All you have to is browse online and then decide which offer you want to activate. Once you decide that you simply need to click on the “show code” option and then use the code when you are making the payment and redeem your discount percentage. You have the chance to get fabulous deals online! Using the Runnr coupon codes you can get an off of Rs.100 on a billing amount of Rs.250. In addition to that, get a discount of 10% on all of your food offers. Similarly, both for the new users and the existing users there are attractive deals using which you can get the best platters for less. That aside, browse through the site wide deals, the cashback offers as well as the promotional discounts that change from time to time! To be able to opt in for the best and authentic of the Runnr promo codes the smart call is to keep browsing HappySale and arrive at the best offers! All you need to do is browse through, read the deal descriptions and select an offer that fits your requirements before the deal expires. Hurry get your best deal today!